Note: This article was first published in The five-a-side Bible, the ultimate book for the small-sided game you love. 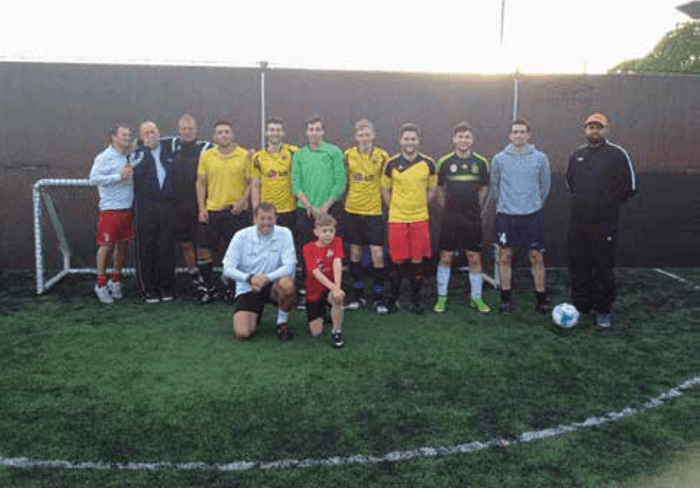 We caught up with Matt Le Tissier to find out how one of the Premier League’s great entertainers keeps his hand in at his local Goals – and how fives gave him an early taste of the big time. 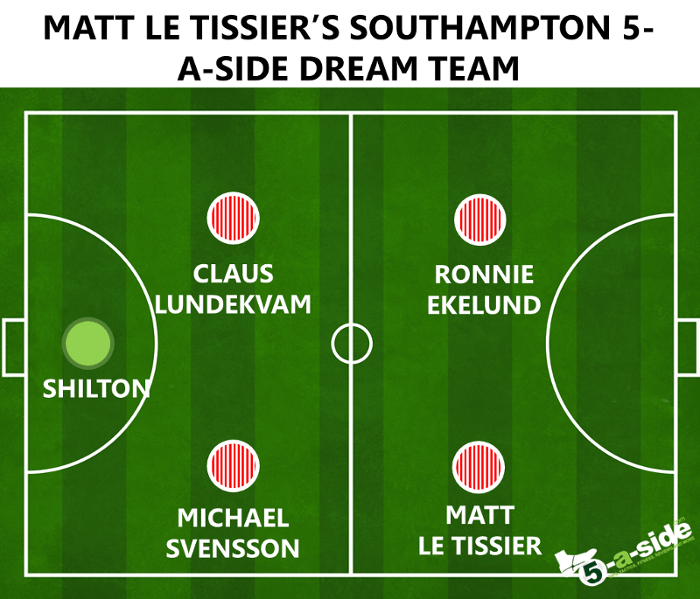 The memory of Matt Le Tissier hipswaying past defenders is still enough to make purists quiver. To Southampton fans, he remains ‘Le God’, a football deity who illuminated the English top-flight in a stellar career from the late 1980s to the early noughties. 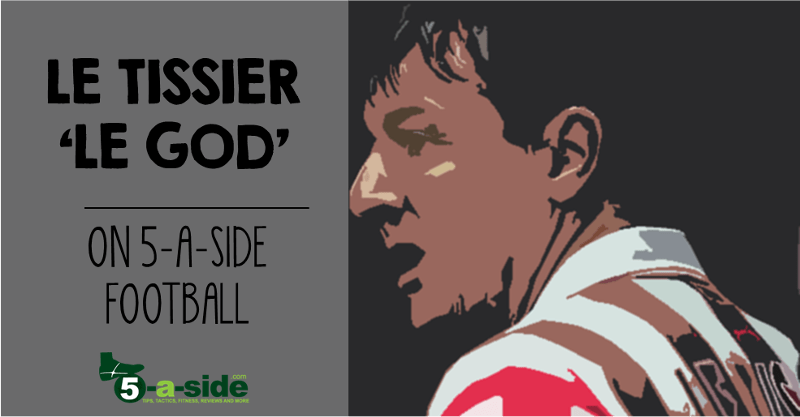 You’ve seen his magic at 11-a-side, time to get the lowdown on his 5-a-side game. You still play 5-a-side. Where is your game? We play at Goals in Southampton, which is a very good set-up. I started in 2013 when I had lost a bit of weight and needed to get my fitness up. We play every Tuesday and usually get 12 bodies. We play 5-a-side with one sub, which gives everyone a little rest. My son plays in goal for our team and I fill the rest of the team up with a couple of mates and a couple of ex-players. We’ve got a lot of players of different standards. From myself, who’s played at international level, to a couple who played at Premier League level, others who played in the lower leagues and then guys who played parks football. The ex-pros are normally in my team. We’re all in our mid-40s but we can compensate for our lack of pace with our experience. The nucleus of the teams is the same every week and the games are always pretty tight. We never have a ref. We always just ref ourselves and, in the last year, there’s been less than 10 free-kicks given. So, football is better when there’s no refs! Can you understand the appeal? I completely understand. It is more convenient. You can do it in the evening after work and don’t need to give up a day of your weekend. 11s can also be a struggle if you’re not as fit, but you can get away with it in fives. One of my mates I play golf with refuses to play in the winter. So, October to March, I would never see him, but he comes along and plays in goals at the 5-a-side. We usually stick around after the game and have a drink, and if there’s a live football game on, we will watch that. It’s a nice social thing to do. I move about a bit. For half the game I’ll be playing as the striker and then for the other half I might play at the back, pass it about a bit and have a breather! Because the parks are so small, you can change places very quickly. Most professionals look forward to the 5-a-side game at the end of training more than anything. There was always a real edge to the games and it could get tasty. I’ve always enjoyed small-sided games. You need good control and be able to wriggle out of small spaces, so maybe it is suited to me. What 11-a-side skills translate well to 5-a-side? When it comes to finishing, the skills needed for 5-a-side and 11s are similar. You have to know where the goal is and know where the goalkeeper is. There are other moments in games which mirror 11s. It’s about keeping control of the ball when there are lots of people around you. In that sense, it’s like playing a whole 11-a-side game in the penalty box! A good goalkeeper is key, particularly someone who doesn’t mind having the ball shot at them from five yards out. It’s also good if you have a couple of guys who know where the goal is, and another couple who can defend quite well and keep the ball – possession is a big thing in 5-a-side. Did you play 5-a-side when you were growing up? I played at the leisure centre in Guernsey and also for the Methodist youth club. Our Methodist club actually entered the national 5-a-side tournament and got all the way through to the final at the Royal Albert Hall – I have actually played 5-a-side in the Royal Albert Hall! I think we won the nationals twice actually. We had a strong team, two of my older brothers played in it too. What advice would you give to help 5-a-side players improve? My advice is not to be frightened to take a chance. You are not always certain to score a goal, but you need to take chances. If that means shooting through legs then that’s what you have to do. Don’t be too careful in front of goal. Even if you miss, you’ll always get another chance soon. We’ve got one signed copy of the 5-a-side Bible to give away to one lucky reader (see picture below)! This is a limited-time competition. All you have to do to be in with a chance of winning is head over to the facebook and like our page and the post below. Simple!